Of the 4,060 species of mammals that inhabit the world, fifty-three occur within the Adirondack Park. These mammals represent 7 orders and 17 families. Some species, like the opossum and striped skunk, are rare and occur mostly at the periphery of the Adirondacks. Other species, such as the white-tailed deer and short-tailed shrew, are common and well distributed throughout the Park. Good housekeeping is a requirement wherever black bears are found. Simple sanitation measures can be the key to avoid attracting bears. Take responsibility for your safety and encourage your neighbors to do the same! If you have curbside garbage pickup– Take out trash just before your scheduled pickup. Do not put garbage at the curb the night before. Standard coolers are not bear-resistant! Bears are intelligent and persistent, making unattended coolers an easy target. Use bear resistant food canisters. These are a highly effective means for preventing bears from getting your food, toiletries and garbage. Use of bear resistant canisters is encouraged throughout the Adirondack and Catskill backcountry, and are required in Eastern High Peaks Wilderness of the Adirondack Park. Pack a minimal amount of food. The less food to store the better. Use lightweight and dehydrated foods. Cook and eat before dark. 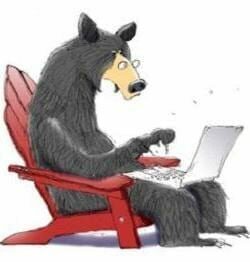 Bears become more active after sunset. Cook away from your campsite. Choose an area at least 100 feet away from your sleeping area. Be neat and clean while cooking. Avoid spills and drippings. Do not pour grease into your fire pit. Keep food in storage containers. Only take out the food you plan to cook. Keep containers nearby and store food immediately if a bear approaches your cooking area. Avoid leftovers. Carefully plan your meals and eat all that you cook. Never leave food unattended. Bears may watch from a distance waiting for opportunities to steal food. Use dark colored cord only as bears can more easily see lighter colored ropes and have come to associate them with a food source, in some areas. 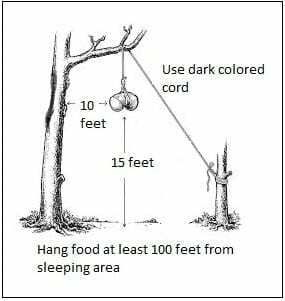 Cord should be 75 feet long and the bag should be hung 15 feet above the ground and at least 10 feet away from tree trunks.